If you're a law abiding US citizen, a team of armed undercover US Air Marshals could be following you on your next flight, taking minute-by-minute notes whether or not you engage in such threatening behavior as sleeping on the plane, using a phone, going to the bathroom or talking to other passengers. The Boston Globe has revealed a new federal program that profiles and surveils ordinary US citizen travelers who otherwise have no legitimate reason for being profiled. 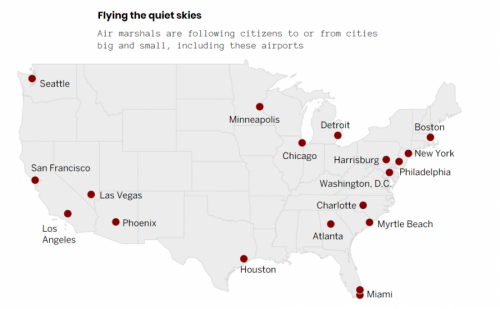 The secret program, called "Quiet Skies", was set up to monitor US citizens with no prior record and who don't result in red flags being raised at the airport. The people surveiled and followed in this program are, according to a TSA memo cited by the Globe article, "not under investigation by any agency and are not in the Terrorist Screening Data Base". In essence, the program gives the TSA the option to monitor and track whoever it likes for any reason whatsoever, effectively granting TSA agents a green light to violate anyone's personal privacy even as the legal and constitutional implications of such profiling remain unknown. And, understandably, internal pushback against the relatively new program has emerged as some Federal Air Marshals have noted that it is a drain on resources and is way too time consuming and costly. Further, concerns have been raised by legal experts, like Jonathan Turley, a George Washington University law professor, who said that "if this was about foreign citizens, the government would have considerable power. But if it’s US citizens — US citizens don’t lose their rights simply because they are in an airplane at 30,000 feet." Predictably, the TSA defended the program to the Boston Globe when asked and declined to note for the article whether or not the program has been successful in stopping any threats. In fact, it wouldn’t even confirm that the program existed. But documents provided to the Boston Globe by FSA sources confirm that this highly controversial program does, in fact, exist. So if you're not on any terrorist watch list and you are not under investigation by the Federal Government, what exactly do armed Air Marshals look for when a "small team of them" watches you as you fly or home to visit relatives for the holidays? how they were picked up when they arrive. 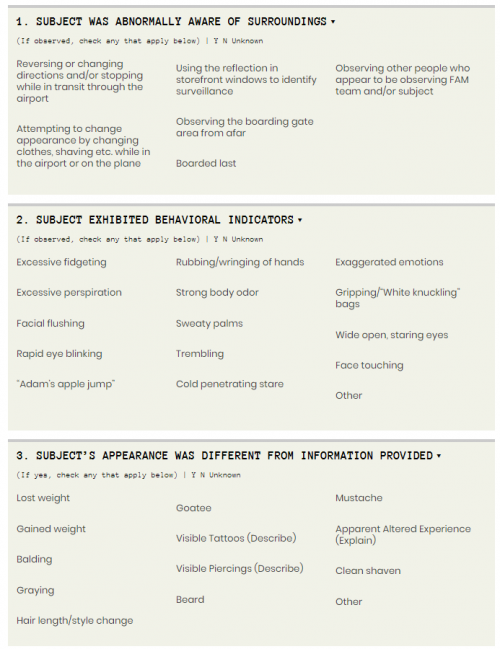 The full "behavior checklist", uploaded on the Boston Globe website, is both astonishing and frightening. 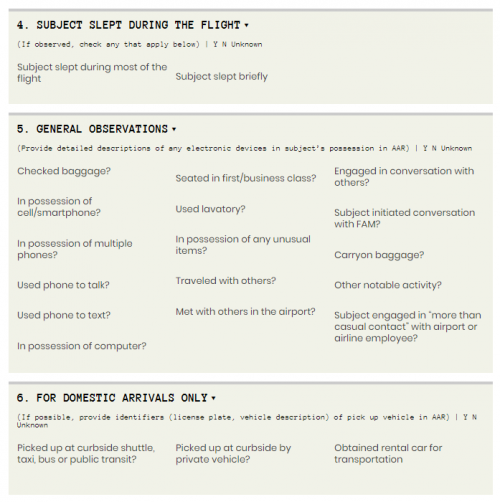 A casual skim of the above "threats" narrows down the list of potential suspects to - well, everybody who flies or has ever flown in an airplane. And yes, Air Marshal have been instructed to focus especially on people who have "gained weight", have a beard, checked their baggage, and either talk on the phone or have a computer: almost as if the government has granted explicit permission for the FSA to profile just about anyone, for any reason whatsoever. ...a team of air marshals is placed on the person’s next flight. The team receives a file containing a photo and basic information — such as date and place of birth — about the target, according to agency documents. Despite its relative recency, the program is already operational across virtually all major airports. And just like Edward Snowden and the NSA, the Globe points out that pushback against this kind of indescriminate profiling is rising as "dozens of air marshals have raised concerns about the Quiet Skies program with senior officials and colleagues, sought legal counsel, and expressed misgivings about the surveillance program, according to interviews and documents reviewed by the Globe." 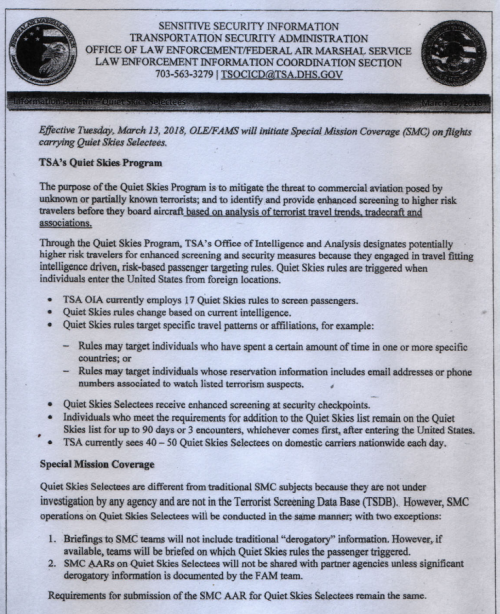 Experts on civil liberties called the Quiet Skies program worrisome and potentially illegal. The biggest irony, as several Air Marshals observed, is that that potentially illegal program which infringes on the privacy and constitutional rights of US citizens, is also being paid for by those very same US citizens. Just like with the NSA. Finally, for those unlucky enough to have "gained weight" since their last observations - or heaven forbid grew a goatee - and triggered the TSA's red flag, once selected for the list they are surveilled for up to 90 days or for their next three encounters, whatever comes first. While the long running practice of Air Marshals Performing surveillance on those who are the focus of government investigations makes sense – this clear abuse of power and disregard for the rights of US citizens is so egregious that even those tasked with enforcing it can’t get behind it.